Whom Pods Destroy returns for another episode of top Trek chat. In this edition we discuss the second season episode By Any Other Name. The story of the Kelvans: all powerful, all conquering multi tentacled invaders from the Andromeda galaxy who can’t take their liquor. This story starts off pretty dark before taking a turn for the decidedly comic. 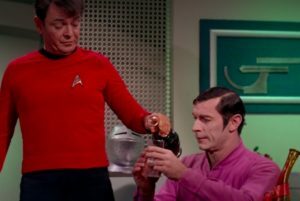 It is most famous for Scotty’s “it’s green” line which was paid homage in the Next Generation episode, Relics. Mark Farinas’ excellent webcomic sequel to By Any Other Name is called Time’s Refuge and can be found here.